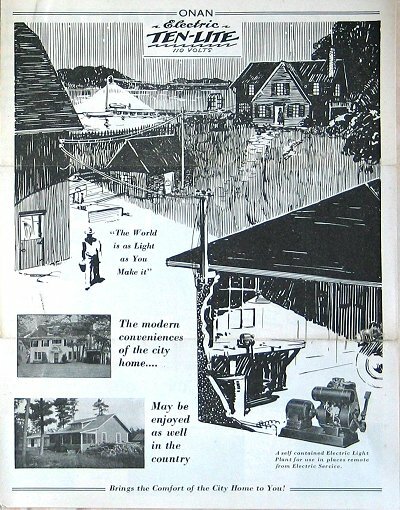 The story of how the first generator set came about is good enough for me. 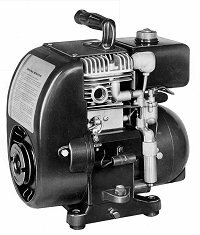 Given what Dave had in hand and his experience it is reasonable to see how he put a purchased Briggs-Stratton engine and a generator on a common base and connected the two with a coupling. Municipal generating stations were built that way and he was just reducing the size. The fact that the generator was Direct Current (DC) is no surprise. DC will run a light bulb just as well as Alternating Current (AC). The light bulb does not know the difference. In fact it glows a little brighter on DC. The light flicker caused by power impulses of the one cylinder engine were another matter. Bud’s tinkering with a spring coupling was the only answer, and it was a poor one. Coupling alignment and spring breakage plagued the setup. At the same time, they were used only a few hours a day and a bit of tinkering with the lightplant was tolerated. Dave began building and selling more of them. The Ten-Lite. One way to sell them was to drive out of town a few miles to where the power lines ended and start knocking on doors. Dave was able to sell a unit, wire the house and get a light in the barn all in one day. 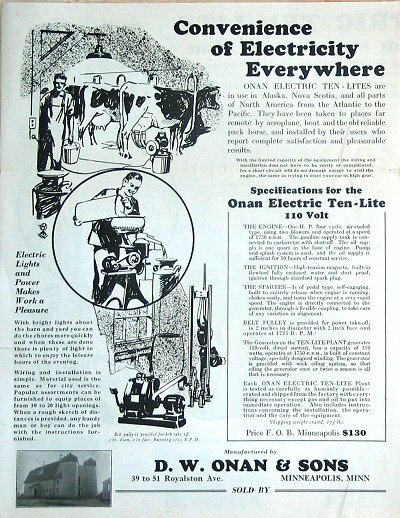 During the early 1930s units increased in capacity for more lights and appliances by connecting larger engines to larger generators. AC current became the accepted standard and electric starting a common feature. If the generator was located away from the house, push-button start and stop was available. Dave wanted to build the complete product to control quality and features. He would build his own engines and generators. Today no one would set up to manufacture engines in small quantities because tooling cost and competition would not allow it. But he had more in mind. He wanted to combine the engine and generator components into a single structure, avoiding a mounting base and coupling. By 1934 he had put this concept together. The result is startling. We are fortunate to have wonderful 78 year old pictures the company made; probably to illustrate a parts book. Everything is hung from wires, still visible, and shows all the moving parts of the unit. I have added the part names. A general description is as follows: generator parts to the left, engine parts to the right. (The generator brush holder assembly is static and attached to the generator frame, not show.) 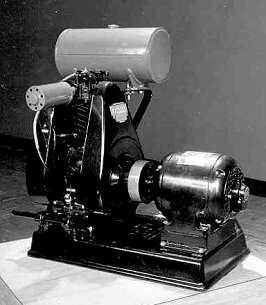 The cooling blower / flywheel is the coupling between the generator and the engine. The generator, flywheel and engine crankshaft are solidly and rigidly attached together so that nothing can change their alignment. This is done with a long stud that goes through the hollow generator shaft into the engine crankshaft. It is secured by a nut which also holds the starter rope sheave. Everything to the right of the flywheel is inside the engine crankcase. An oil pump forces oil to the front main bearing and other moving parts. AC, alternating current, was the mainstream. AC required precise engine speed control to provide standard 60 cycle current. 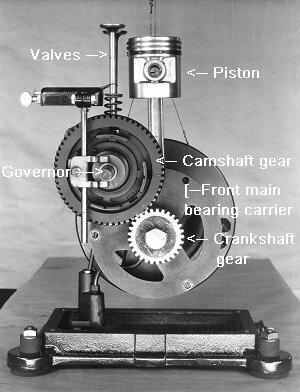 The governor mechanism was contained in the front of the camshaft gear. A shaft connected to the governor arm which led to the engine throttle. The high speed moving parts were inside the engine with abundant oil for lubrication. Where electric starting was desired, DC windings in the generator could turn it into powerful DC cranking motor, eliminating the need for a separate starter motor. 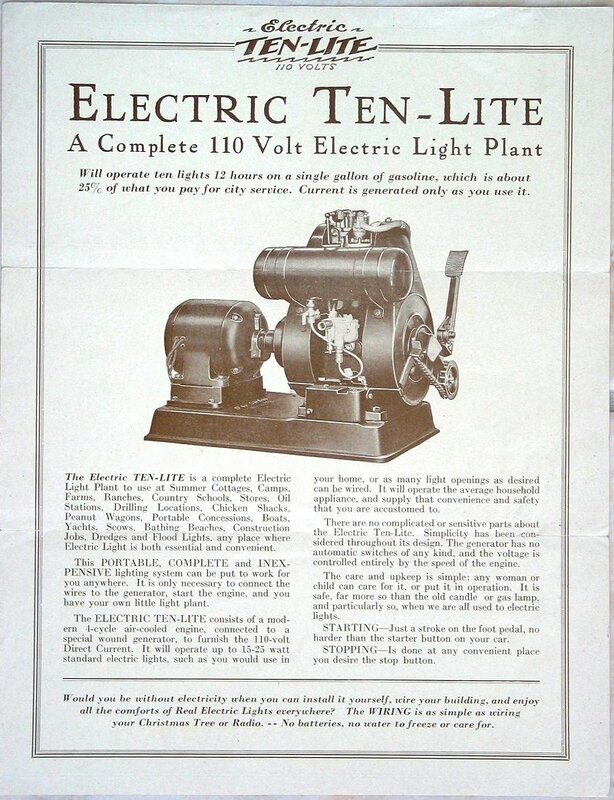 His own innovation had solved the light flicker problem electrically but involved timing with the engine power pulses. He could now attach a second set of contact points actuated in the same way as the ignition breaker points. This contact connected a resistor into the generator field winding circuit to momentarily reduce the output voltage. It is the solution which endures today with all 1800 RPM generator sets. In a couple years it was found that the center flywheel / blower was a problem in rain and high temperatures. The flywheel / blower was moved to the other end of the engine. 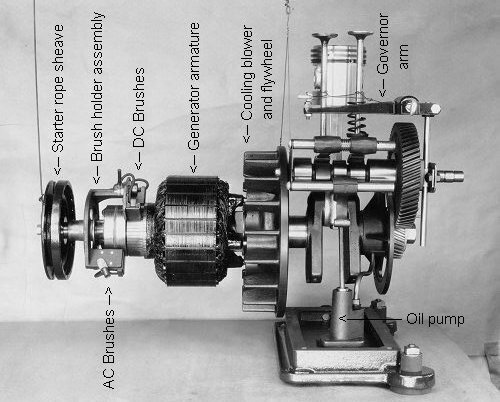 The rigid coupling of engine and generator was maintained by an external taper on the generator shaft fitting an internal taper on the engine crankshaft. The assembly was then through bolted together as before. In modern industrial equipment color is identity. Saws were black. 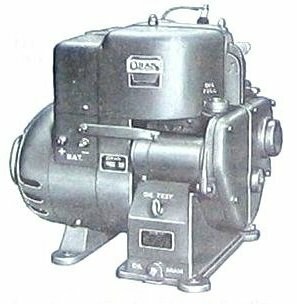 Briggs-Stratton engines were painted black, so the whole Ten-Lite series was black. When Dave began making his own engines and generators he wanted to define them with a color. He chose Forest Green. A very dark green. It didn’t show dirt and covered a multitude of sins by the iron foundry. During World War II colors varied depending on what the government wanted. Army olive drab, black, Navy gray were a few. 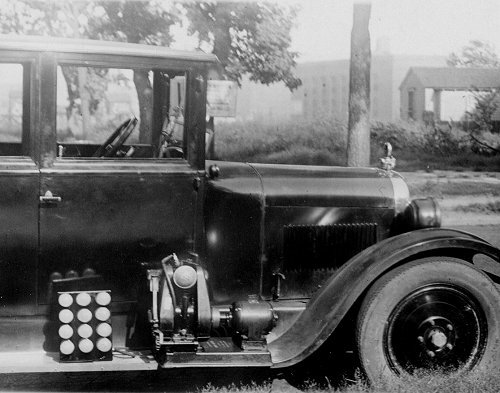 After the war the company chose a medium gray. I don’t know who picked it and it didn’t conflict with anything but the mouse gray product got lost in the shadows. In the early 1950s staff worked with Minnesota Paints on a new green. It was a medium green with a bluish cast caused by its metallic nature. Called Silver-Green, it was lush and had good covering qualities. It was used until the 1980s when the switch to electrostatic spraying meant the end of metallic paints. 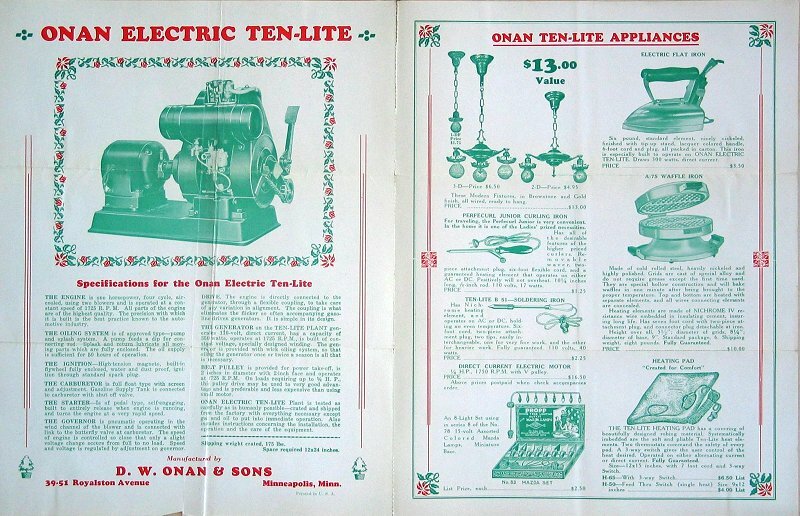 As reformulated it lost some of the lushness but is used today to identify with the Onan name on generator sets. There were exceptions. OEM customers could specify primer. A 1960s trend in the marine industry was painting engine rooms and equipment white. The marine generator sets followed with green on the name and model identification. Nobody ever asked for black.